Lately a metaphoric earthquake struck in football minded Holland. The Dutch FA & several ‘experts’ claim ‘Dutch football has to improve’. Despite a 3rd place during the last World Cup in Brazil for the Orange Lions. We can compliment the Dutch FA & co for having such a strong developed Growth Mindset; always on the lookout for improvement. And room for improvement exists especially within our youth academies. In Holland sympathy for and focus on our youth players is tremendous. They are often given a chance in the Dutch Eredivisie; the start of their professional football career. And some of them develop into world class players – like Arjen Robben or Wesley Sneijder, who bring the club and country glory. Therefore we value our youth academies. Therefore we need the best youth academies. Clearly a lot of things can be improved, or according to Dutch FA must be improved, in our academies. 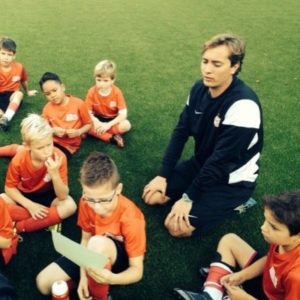 One of the greatest improvements to be made is the winning mentality of our youth players, claims Dutch FA. Our youth lacks this winning mentality. How then can we create that mentality? Can we create and develop it, or is something you have or don’t? What is the definition of a winning mentality? To me giving everything you’ve got (effort/perseverance/take initiative/being a leader) in order to win, also in the face of adversity (e.g. red card, missed chance, goal down) is the winning mentality. And I am convinced it is possible to create and develop this winning mentality. Then how? We could demand this winning mentality from our players: ‘I want you to want to win this match’. Would that be of any help in creating the winning mentality? I am not sure. I do not think you can create the winning mentality by demanding it from players, that will has to come from within; intrinsic motivation. It kind of resembles us wanting the children wanting to learn. We, the academies, should make the conditions in such a way that the child is motivated to learn. This motivation too has to come from within. When a child’s motivation to want or do something becomes extrinsic, like us requesting him wanting to win or learn, he will lose his autonomy. His freedom of choice. Autonomy – which is part of intrinsic motivation (together with feeling competent and related) – will lower and might eventually take intrinsic motivation away to be replaced by extrinsic motivation. He now has to win or learn, because of the coach wanting him. Extrinsic motivation leads to loss of interest eventually. So requesting the winning mentality, I reckon, will not work. If this seemingly most logical solution probably does not work, then what does? Let’s have a deeper look at the ‘problem’, or challenge rather. Our youth has a lack of winning mentality. Hang on, let’s repeat this. Our youth has a lack of winning mentality! This sounds odd, at least to me it does. Football is a game and games are there to be won. Everybody wants to win, there’s no single person I have met who says ‘I will play this game so that I can lose’. If I look at my U9 boys I sometimes am more busy making sure they don’t fight over winning or losing than that I can coach them properly. So everyone wants to win and if that’s not the case then something is blocking that. Like learning, every child wants to learn or become better at football and if he does not, something is in the way. Thus what could be blocking the will to win in young football players? Enter Maslow. Maslow was a psychologist on a quest to explain human behavior. In doing so, he came up with this pyramid of hierarchical needs. In his pyramid needs are ranked in 5 layers. You need to fulfill the first need (layer) in order to reach the second. With a bit of imagination you can compare this pyramid to a video game with 5 levels. If you have completed level 1 you go up to level 2, if completed you go up to level 3 and so on. So how does this pyramid look like? The first need or layer are the bodily needs for survival: the need for food and water. Layer 2 consists of the need for security; you need to feel safe. The need to belong, to have social relationships is situated on layer 3. On layer 4 you will find the need for confirmation & acknowledgement, we need to be recognized for our skills, strengths and achievements. The top layer, number 5, has the need for self-actualization, to become who we want to be (in football: a winner). Maslow’s theory, as you can see, focuses on human behavior in general. Let’s take away the general and make it football (soccer) specific. To Maslow you could only enter the next level if the previous one is completed. To make it football specific I reckon the needs consume our focus. It is better to have fulfilled them completely, though it is not necessary in order to move up a level. We all have a capacity (focus) for our needs. For example if we complete the first 4 needs, then 100% of our capacity will be on winning. Let’s elaborate on this. The highest level in football is of course our need to win. To win the game, the match, the (Champions) League or the World Cup. To reach this need, we need to fulfill the other four needs to be completely focused on winning. Firstly we need to meet our need for food and drinks. A lot of players eat pasta and have sports drinks to complete this level. Then they move up, they need to feel safe on the pitch, no (physical) harm will be done to them. That is why matches in war environments are cancelled or rescheduled. Maybe even teams that play away, especially in a stadium with aggressive home fans, have their focus (partially) on their safety. They do not feel comfortable, so part of their focus gets lost here. Those two needs will not be the blockings in the winning mentality of our youth players. The needs on layer 3 and 4 though are. These are the need to belong, the need to be acknowledged, the need to feel valued in a team. Which players in your team most often express the winning mentality? Probably the players who feel they are the best. They have secured their spot, their value in the team. Thus their need is to win, to outperform the opponent. Imagine, would you want to win if you are not sure you will play next week or even worse, you are unsure whether you will be in the academy next year? You and these players, given the choice, rather win over lose, of course. And this want comes in 2nd place, right after your first priority: to make sure you belong, to make sure you are valued in the team and academy. Their focus can be on playing well, on convincing staff and others that they have value for the team and should be playing in the academy next year too. If playing well combines with winning then that’s perfect. If playing well is accompanied by losing that’s a shame, however no hard feelings. Imagine how they might feel if they played badly. Their first priority thus is to play well, to be acknowledged and valued. Players in this situation are still competing with themselves and other teammates, that is the most important battle to them. Not outperforming the opponent. Therefore, in my opinion, we have to make sure the 4 underlying needs are met in order for our youth players to have that mentality to win. Have them energized with sufficient food and drinks, guarantee their safety and most of all express their belonging in the team, acknowledge them and value them for who they are! Then you will create players who are hungry to win. In my next article I will zoom in on how a coach can help his players fulfill their needs so that they have their focus on winning.